Question: I want to position my bed according to Feng Shui. At the moment it directly faces the door which is not good, but on the other two walls are a window and a radiator so I cannot place it there either! It is a fairly small room. There is also no space between the bed and the door when I can place a piece of furniture to block the energy. Help! Answer: When the bed is in direct line with the door, it is referred to the coffin position. This position is in direct line to the incoming chi or life energy and can cause health issues typically seen in the feet or legs. I would recommend trying to position the bed on one of the opposite walls. You don't want your bed to be on the same wall as the door as this can cause restless sleep. Take a look at the free Feng Shui Guide and review being in the command position. 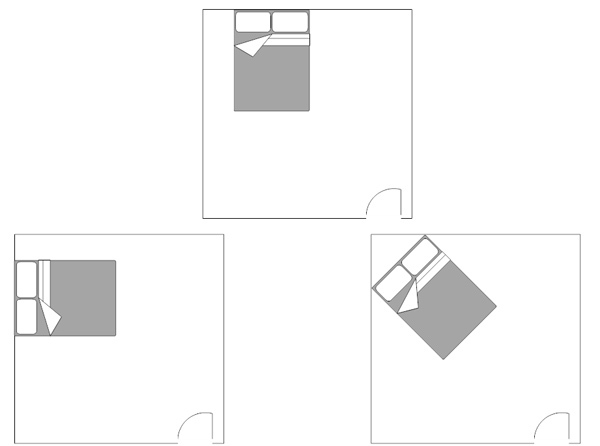 This illustrates the 3 command positions for the bed to be in. It is ok to have your bed to be directly under a window. The most important thing to remember here is having a solid headboard that is firmly attached to the bed. Click play to watch the video below to better understand the proper placement of your bed according to Feng Shui.